For most of human history, solar eclipses have been unexpected and terrifying events. All over the world, across all cultures and societies, people have reacted to these hair-raising experiences in a very human way. They have made up stories to explain why the sun sometimes vanishes in the middle of the day. In China they told the story of a heavenly dog who tries to eat the sun. Many South American tribes believed eclipses were caused by a giant bird attacking the sun. In North America, the Nuxalk people, who live in the area around Bella Coola in Canada, thought eclipses occur when the sun (rather carelessly) drops his torch. These myths and stories form an important part of human history. They are some of our earliest attempts to explain the mysteries of the universe. Today we know precisely when eclipses will happen. That’s good news for us, because it means we don’t have to run around being terrified. For storytellers, however, it’s bad news, because we no longer have the chance to invent tales to try and make sense of what’s going on. 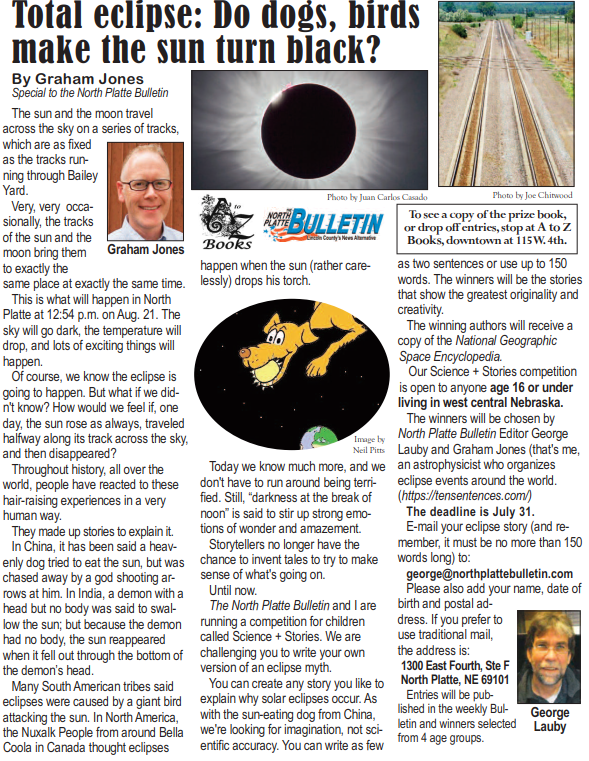 Together with the North Platte Bulletin and A to Z Books, we’re running a creative-writing competition called Science + Stories. We’re challenging young people in west central Nebraska to write their own version of an eclipse myth. Entries can be up to 150 words long, and there are four age groups. The winners will be the stories that show the greatest originality and creativity, and the winning authors will receive a copy of the National Geographic Space Encyclopedia. The total solar eclipse of August 21st 2017 will cross the US from coast to coast. The path of totality (the very narrow, dark orange strip in the map below) runs through 14 states: Oregon, Idaho, Montana (a tiny bit), Wyoming, Nebraska, Kansas, Iowa (a tiny bit), Missouri, Illinois, Kentucky, Tennessee, Georgia, North Carolina, and South Carolina. The whole of North America – together with the upper part of South America, plus a tiny bit of western Europe – will experience a partial solar eclipse. This entry was posted in Classroom activity and tagged Science + Stories, solar eclipse, storytelling. Bookmark the permalink.